Yue Hwa Singapore offers an extensive range of products, and specializes in Chinese silk, food, tea, cheongsams, antiques and gifts. Yue Hwa also holds seasonal promotions which feature delicaies and delights like mooncakes. Yue Hwa Chinatown is situated in the former Nam Tin Hotel and the store combines both contemporary and original architecture. Visit today and shop for traditional and authentic Chinese products at affordable prices. To find about Yue Hwa Singapore promotions and the latest store events, visit the website. Follow them on Facebook and stay updated about the latest Yue Hwa sales. 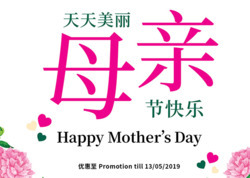 Get the Yue Hwa imperial card and enjoy a 10% discount storewide on regular price items. The store was established in Hong Kong over 50 years ago. You can also visit Yue Hwa Jurong Point outlet in the west. Do you want to receive more offers from Yue Hwa by email?